Just A Car Geek: Rare Romanian ARO SUV - Recovered Theft - Turn It Into Whatever You Want It To Be..
Rare Romanian ARO SUV - Recovered Theft - Turn It Into Whatever You Want It To Be..
"(This) is actually an ARO 10, not a 244 - different model entirely, this one here was never supposed to make it into the US, the 244 it's bigger brother was the only one slated to make it here." I stand corrected and appreciate the input. ARO is a Romanian built SUV. They were almost sold in this country. Twice. A New England based (CT, if I remember correctly) company tried first. They were looking to bring in a very utilitarian version of the vehicle. They made the mandatory US safety changes and were planning (I was told) to use the AMC 4 cylinder engine and transmission / transfer case found in the Jeep Cherokee in it. (I've also been told they were thinking of using a 4 cylinder Ford engine) I saw two of these vehicles. One, with dealer plates, was on I95 in CT and much later I saw another one parked at a used car lot in Hadley, MA. I stopped and looked at the one at the used car lot. I remember it being in very rough shape. All the interior switch gear seemed to be from 1970s Renaults. The engine had its head off and I couldn't tell where it was from. All-in-all it looked very basic. It looked like the type of SUV you might want to take off road or use as a winter car, but not one you'd want to drive everyday. Cross Lander planned on using a Ford V6 engine, which would give the ARO plenty of power. A diesel version of the vehicle was also planned. By 2005 Cross Lander managed to get the vehicle DOT and EPA certified and had signed on quite a few dealers. Reviews of the truck, while not glowing, were mainly positive, especially regarding its off road abilities. Things were looking good for Cross Lander. Then came the big problem... A legal battle between Cross Lander's founder and Romania. Romania claimed Cross Lander did not uphold it's part of the agreement. They were planning on bringing criminal fraud charges against the founder of Cross Lander. Cross Lander counter sued and stated "that a 'web of corruption' led to the failure of the Romanian government to abide by its obligations under a privatization agreement". That was it. Cross Lander closed its doors in 2006 and only a handful of prototypes and test mules ever made it into the US. This ARO, being offered on eBay, is most likely one of the Cross Lander prototypes or test mules. It is not a ready to drive vehicle. A recovered theft, it needs an engine, transmission, radiator, front seats and speedometer. So why am I posting this vehicle? Well, this is a chance for someone to turn an already unique SUV into a really unique SUV - Some custom seats, a big engine, the possibilities are many. Click here to see the eBay listing for this ARO. The Cross lander version was to have the Ford Cologne V6 in it. That may be a drop in. Probably any V6 or I4 would fit in this. That is actually an ARO 10, not a 244 - different model entirely, this one here was never supposed to make it into the US, the 244 (it's bigger brother was the only one slated to make it here. I own a '91 Aro 244, was sold from a dealer in NY, during their first attempt at trying to make it here. As basic as it gets, laughs at snow, though! 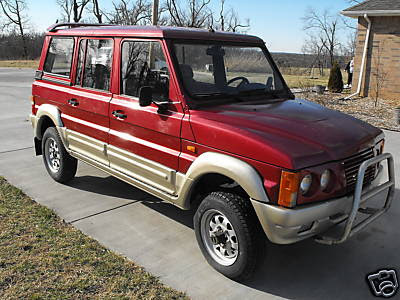 I'm just such a car: ARO 10.4 4x4 with a soft-top (I live in the north, beyond the Arctic Circle, near the North Pole). Come to Russia - a ride. Who can help with the technical documentation for this car? that is actually a production ARO 11.4 (based on the ARO 10 model family), it is not a prototype. Was probably a grey market import. It has selectable 4wd, 2 speed transfercase and optional rear locker. Power originally came from a romanian 1.6 petrol or Renault 1.9 diesel. That is an aro 11.4 tha originial motor was a dacia 1.6 or a renault . Actualy cross lander fucked up tha aro factory in romania and sold the machining and heavy tools to scrap metal . The Aro brand and cars ar pretty old i beleve that last cars from factory ar made in 1998 so' don't espect luxury or hi performace , but they endure pretty much anithig are reaeble cars .